No preservatives and artificial colouring. Ingredients: Bean Curd (GMO), Chilli, Sesame Oil, Vegetable Oil, Salt, Water, Malic Acid, Citric Acid. 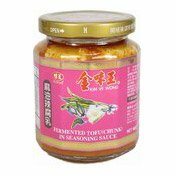 Simply enter your details below and we will send you an e-mail when “Fermented Tofu (Chunk) In Seasoning Sauce (辣椒腐乳)” is back in stock!